Today a new law brought by the Islands (Scotland) Bill has come into force to ban public bodies from using maps that display Shetland in a box rather than in its natural geographic position 150 miles north of the Scottish mainland. The BBC article about the law, instigated by Islands Lib Dem MSP Tavish Scott and supported by many who live on the Shetland Islands, uses a version of Maproom’s Outline Map of Scotland to illustrate the news item. Now, whilst we are delighted to spot one of our maps getting a lot of attention, we want to point out that this map and most of our other Scotland and UK maps have always offered designers the option on whether to show Scotland in its accurate geographical position or in an inset box. 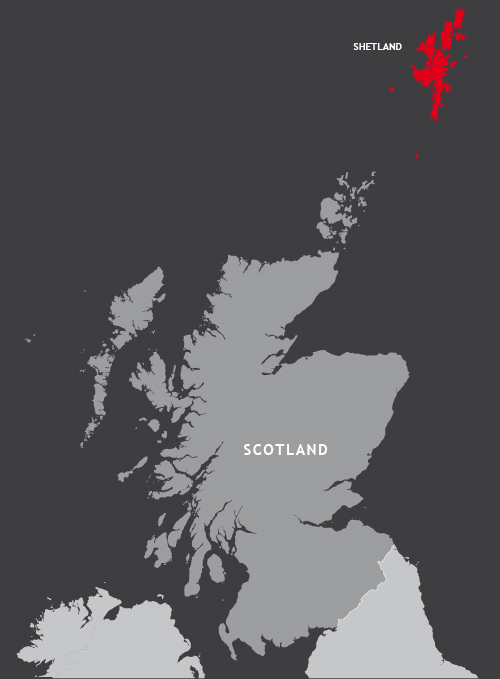 With a Maproom map you will usually find Shetland in its natural geographic position on the first artboard of the Illustrator file. Use this version if you want or need to. Then again, that’s a lot of empty sea top left that designers may find themselves itching to fill or crop out. On the same Maproom base map file you will also often find a smaller artboard and easy select layer option for Shetland in an inset box. That’s going to be an easier scale and layout for many graphics projects. If working in Adobe Illustrator, you can turn on the Scotland inset with one click of a button. BUT THIS LAYOUT IS NO LONGER ALLOWED IF YOU ARE WORKING ON AN OFFICIAL DOCUMENT FOR A PUBLIC BODY. On the one hand, we understand the annoyance felt by the 23,000+ inhabitants of Shetland when their islands are completely left off maps of Britain. Orkney and Na h-Eileanan Siar (the Outer Hebrides) are often left off too. We’ve seen maps that even leave off Skye and Mull. In fact, the main aim of the islanders in bringing this mapping requirement is specifically to show the remoteness of Shetland, which poses great challenges in transportation, communications and other aspects of the local economy. On the other hand, the omission of Shetland from many maps is not surprising, not only because of its far distant location and the visual problems this poses for designers, but also because any graphic designer drawing up a map of the UK from scratch will find it takes 50 times as long to draw all those Scottish islands and serrated mainland coastline as it takes to draw an outline of England. Oh, the temptation to draw a solid blob for Shetland rather than its four main islands, 12 other inhabited islands and more than 250 smaller islands! Save yourself days of effort and buy one of our Scotland, UK or British Isles maps. You can also make a dedicated map of beautiful, far-flung Shetland by zooming into the detail of this group of islands such as in the example above extracted from our Best Detailed Map Base of the UK. Maproom will be producing a special edition base map for official maps of Scotland with Shetland, plus secondary locator insets for all UK maps with a Shetland box option in due course. Please contact maproom@thamesidemedia.com if you require this urgently or if you have any requests for the mapping of Shetland and other Scottish islands.